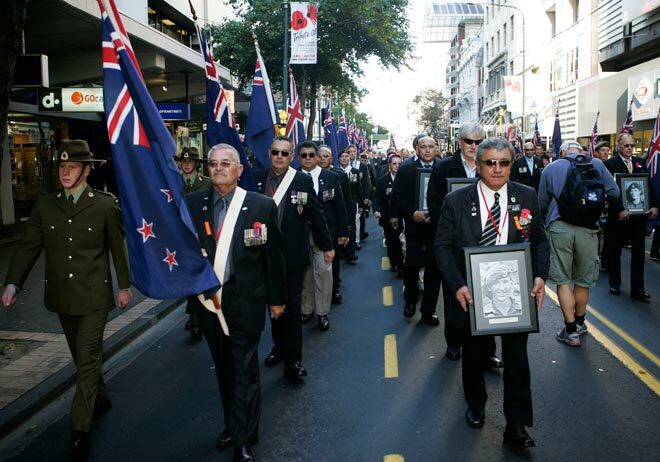 Vietnam veterans participate in an honour march in Wellington during the Tribute 08 gathering on 31 May 2008. Many veterans felt their service in Vietnam was not given sufficient recognition and that the government and the public had ignored their contribution, despite the fact that the 161st Battery paraded through Auckland in May 1971. Criticisms by anti-war activists upset some returned soldiers. This was compounded by the fact that few people at home, including older Returned Servicemen's Association members, took much interest in their Vietnam experiences. The long struggle to gain acceptance of Agent Orange claims added to their bitterness. The veterans' concerns were addressed to some extent in 2008, when Prime Minister Helen Clark apologised to them on behalf of the government. The gathering in Wellington that followed was known as Tribute 08. It included a parade in which veterans and relatives carried pictures of the Vietnam dead, an unusual event in New Zealand veterans' parades.